"She's working on something new. She's done with Kushiel. I hear it's much lighter and more playful." WOW. What a freaking tease, right? I am subscribed to Carey's FaceBook page, where there's a lot going on, and I checked her website, but there were no hints. It's good to know people are talking! :) I do have a new project coming out this fall -- it's an urban fantasy series called Agent of Hel, and the first volume is "Dark Currents." I'll post the description below. I'm calling it a blend of wonder, whimsy and creepiness! Dark Currents is set in a small Midwestern resort town where paranormal tourism is a booming business. Daisy Johanssen, an incubus’ daughter raised by a loving single mom, is the liaison between the eldritch community and mundane authorities. Most of the time that doesn’t entail anything more challenging than retrieving stolen goods from a puckish pickpocket or tracking down a tourist led astray by a will-o’-the-wisp, but when a young man drowns in an apparent accident that’s not what it seems, Daisy’s job turns deadly earnest. I love the sound of that! Dark Currents is available for pre-order at Amazon, but at this point, we apparently know more than they do, since there is no description there. Ms. Carey, thanks so much for the scoop! ps, I really enjoyed the sequel to Santa Olivia, called Saints Astray, released last November. I mean, how do you not love a book with werewolves, rock stars, a Vegas kidnapping, diplomatic immunity, and, well, a small revolution? Plus, Charlie's Angels cover. Excellent! Photo credit: I stole the author picture from Ciara, without permission (! ), because it's an event that I was at and I'm impatient. :-) Ciara, if you are not happy with that I'm happy to take it down and use a stock photo. 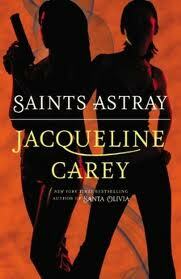 I did read Saints Astray and really liked it. It was much less gritty than SO, though definitely had some dark elements. The outside world was much... brighter, I guess, than I expected it to be. Oh, I am excited! I had heard about Dark Currents, but this is certainly the most comprehensive summary I have found yet! I will miss Terre D'Ange, but I know that Jacqueline Carey has so many more stories to tell, so I don't really begrudge her the departure -- especially if it results in something as great as Santa Olivia or The Sundering duology. (I have to admit, I wasn't crazy about Saints Astray. I didn't hate it, but I think a lot of it came off a little TOO perky for my tastes).